Discussion in 'Steam Traction' started by GSN, May 15, 2015. I would keep in close touch with the management at Williton. We intend to, the chaps at Wiliton are some of the genuinely nicest people I’ve meet in the preservation scene... they also have make a good cup of tea which is always important. It's amazing how a coat of paint can work wonders. I know there's a lot to do but looks like she's coming along nicely. Kudos. Indeed. This loco would look amazing in Toddington yard alongside 35006 one day at a future Cotswold Festival of Steam. Well? Stranger things have happened! Well done to the 35011 team. martin1656 and flying scotsman123 like this. Hopefully in the not too distant future you could have 35005, 35006, 35011, 35018 and 35028 all together. Although some people might consider that overkill. Kinghambranch and siquelme like this. And thanks must go to the owner, who realised that it was beyond his own resources and set out to get the 35011 group up and running, i'm more confident that 35011 will in time one day be a working engine unlike its site mate 35025 who's owner appears to still be in cloud cuckoo land. ( unwilling to sell but does not have any plan to kick start that engines restoration). ohh, now you've done it, i've just had an accident , 35028, very unlikely, unless you have quietly purchased the trackbed from Hunting butts tunnel to Cheltenham and started extending, the other way. We do own about a mile more track bed south of Hunting Butts, at one point there was talk of putting some track on it in the medium term but gone quiet now. I'm still in favour of the "deviation" plan devised by a couple of members whereby after leaving Hunting Butts, you sweep right and link up with the mainline on a new formation. Less than a mile, all over open countryside. As I said, less than a mile I think. In all likelihood the council will say "sounds great" in a meeting but they're not exactly flush with cash at the moment. still be cheaper and more practicable than any extension beyond Broadway, but getting back on subject I think 35011 will certainly be an attraction anywhere she may go. now that would be an outbreak of BIG CHUFFERITUS on a scale never seen before I think that victims would have to be quarantined at Toddington for at least 3 days, , still FS123 can provide the bacon sarnies can't you Alex? We like big chuffers on the GWSR, this week we've been running two pacifics, this weekend it'll be a pacific and a King, and the King all next week as well. We currently don't have a single tank engine on the line! If Gordon were restored then you could reenact connecting at Liss for the LMR. Maybe if we flutter our eyelids at the KESR they might lend us the officers saloons as well. But more seriously, I really like this project because 35011, is at first glance such a basket case and to say that you want to unrebuild it is exactly the sort thing that get the forum net curtain twitchers tutting away saying that it can’t be done. It is early days and I am sure there will be setbacks but I think it has done a really good job of capturing people’s imaginations. No way can 5 Bulleids can be considered over kill!! Romsey, Spamcan81, Monkey Magic and 1 other person like this. oddsocks, weltrol and 35B like this. if your business plan is seen as doable. Now is when your money is vital. Come on, join up and support something so many must have wished for many years. It cannot happen without money. 1) We are getting all the various components for the trailing truck to enable a quick overhaul once the loco is stripped down. We recently purchased some keeps through the MHR, have made a pattern for the axle box covers and got them cast, the dust covers for the spring beams have been made and trail fitted, springs were bought several years ago, the spring beams have been ordered and one of our volunteers will be machining the hangers. All this leaves is some small easily made components which will be made after the hangers. 2) Our big project is the cranking up the pressure appeal which will see us replace GSNs missing crank axle. We’ve had a set back recently when our original supplier turned around and said they couldn’t do the job but a new one has been sourced. Members will more about this in the Packet out in the next couple of weeks. 3) We are trying to move the locomotive to the south west to enable GSN to be stripped down and the real restoration to begin. 30854, Smokestack Lightning, HY_4273 and 4 others like this. 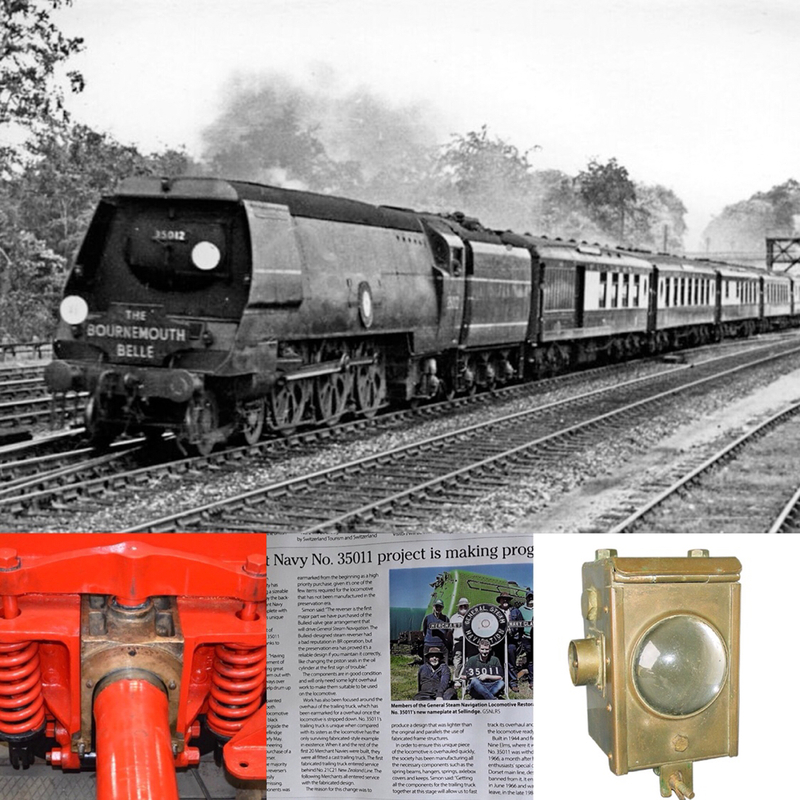 The lastest news from the 35011 project featuring an update on our efforts gathering the various components required to overhaul our trailing truck. S.A.C. Martin, 240P15, 30854 and 3 others like this. S.A.C. Martin, jnc and OldChap like this.